it's so dark and mysterious! Love it! I right now in love!! Is this a good primer? have you used urban decay's? If yes can you tell me which one is better? 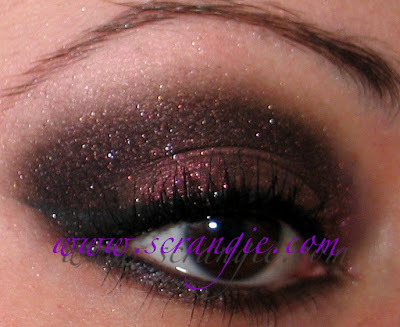 wow Velvet Vampire looks so great on you - it does not look like a pretty color in the photo sample on Fyrinnae's site! Une Ruxi a Paris, Too Faced Shadow Insurance? Yes, it's great! It's my holy grail primer. I like Urban Decay's too, but I prefer Shadow Insurance. I can't tell which will be better for you, but Shadow Insurance is better for me; sometimes I find it harder to blend shadows over Urban Decay Primer Potion. Velvet Vampire is also one of my favorite Fyrinnae colors. I agree that it is a MUST HAVE! This is gorgeous on you! I think I'm going to have to try to replicate this look the next time I go out dancing. Gorgeous! OMG this is insanely gorgeous!!! We just wanna let you know that you have been tagged for the Stylish Blogger Award ! I just got Velvet Vampire a few weeks & it has quickly become on of my favorites. It's gorgeous and versatile! I couldn't read the post. lol But I did it. Your eye make up is so gorgeous!! OMG this is sooo gorgeous!! I love it so much! wow, this is absolute perfection!! I think there's going to be a run on this makeup. You make it look even more amazing. I've never tried any of this brand. Must go take a look!